Our guide to the Best Pickleball Paddles for Beginners - Updated in 2019! If you just started playing pickleball and you're looking for a list of the best pickleball paddles for beginners - you've come to the right place. Chances are, when you got introduced to the game, you may have borrowed a friend's paddle or used a free wooden paddle many recreation centers or YMCAs offer. Now however, you're hooked. You can't stop playing the game and you want a paddle of your own! The goal of this article is provide you the most up to date list of the best pickleball paddles for beginners. These paddles range from graphite to composite, come in many different shapes, sizes and weights - all without draining you're bank account along the way. If you're looking to grab an inexpensive paddle that performs well, and is reliable, these are the pickleball paddles to choose from. - For our list of the Best Pickleball Paddles of 2019 good for all skill levels, click the link. - Ever wonder what kind of paddle tends to have the smallest sweet spot and more miss-hits? What I learned from 4 paddle industry insiders will shock you! Our list of paddles featured in this article is quite lengthy, because there are a lot of quality beginner paddles to consider from some of the top paddle manufacturers in the sport. However, there are many other paddles, in similar price ranges that we would not recommend. Why is this? Well for starters, they're not made by common manufacturers let alone the top brands. In addition, some of these paddles are sold only online from online retailers. You cannot go into a common sporting goods store and find these paddles. In our opinion, this is not ideal. We've said it before, just because a paddle is sold online and popular, doesn't mean it's a good one. Research needs to be done. Second rate paddles in the $20-$30 range won't help you improve your game, and they won't stay in shape very long either. But, pickleball paddles for beginners don't need to be $100 either. And that's where we come in. We've done all of that work for you to create a complete, extensive list of the best pickleball paddles for beginners. 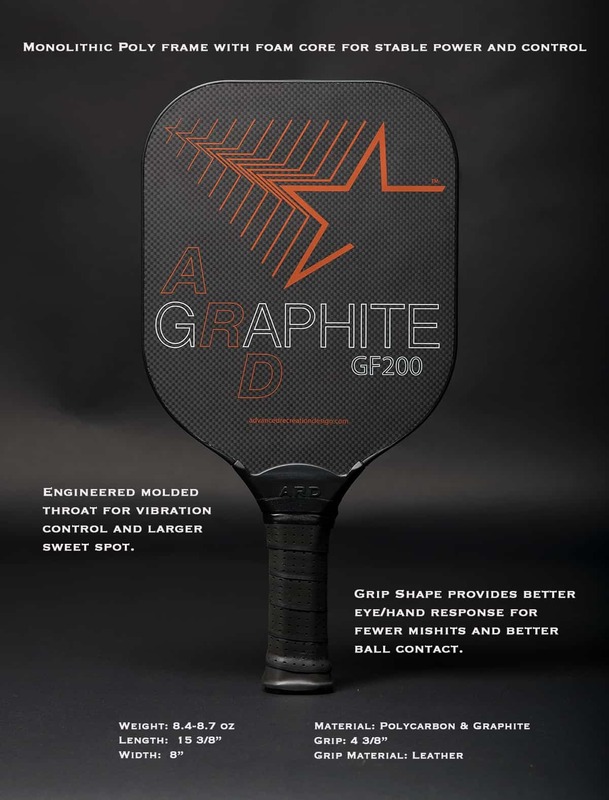 Our top pick for Best Beginner Pickleball paddle is the GF200 from paddle manufacturer newcomer ARD or Advanced Recreation Design. The GF200 is their entry level model however it's also the company's most sophisticated racket as well. This flagship graphite paddle has something very unique about it. In fact, it's a one of a kind concept, using ARD's patented "throat" design. The throat concept is a structural component to the paddle connecting the paddle face to the grip. Most paddles connect the face to the grip all in one. Think of the ARD throat design as the neck that connects the paddles head to it's torso; or grip. It's a structural component that adds to the paddle's large sweet spot and improves stability. In addition it provides the player less vibration and more consistent performance. No other paddle on the market offers this! The polyurethane core adds pop for when you need to push your opponent back to the baseline on serves and returns. It also gives the paddle good touch and control at the net for a consistent soft game when dinking. We also like that for a beginner paddle, it's slightly heavier than others. Weighing between 8.2 to 8.4 ounces, this paddle can deliver an aggressive smack and give newer players ample power while they're still learning shot and stroke technique. 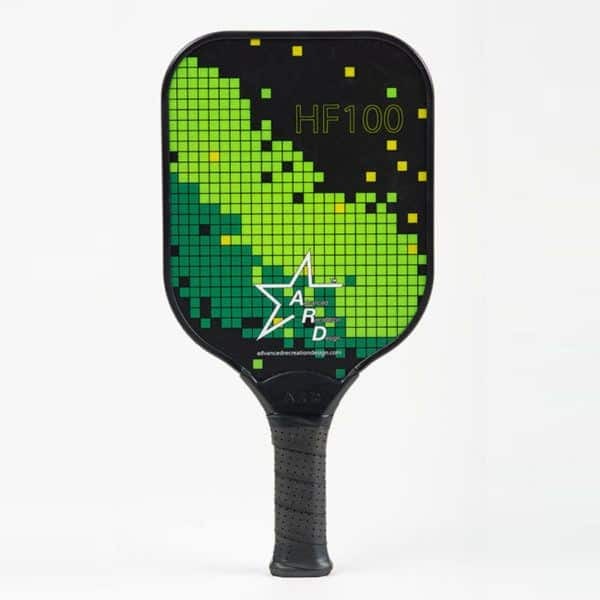 For more on the GF200's brother, the composite HF100 and why it made our list of Best Pickleball Paddles for 2018, click here. Paddle Dimensions: 15 5/8" x 8 1/8"
Beginner pickleball players will love this paddle's overall feel and forgiving sweet spot. Those coming from a tennis background will feel right at home because of how ARD designed their grip. Although slightly heavier then some more expensive paddles, brand new players appreciate the power that comes with a slightly heftier racket. Young players love this paddle's cosmetic approach as well. The graphics exude a youthful, energetic and professional look that will stand out from more traditional beginner paddles. Also, players rave about the price tag! Given how ARD spend three years developing and tweaking the design of the GF200 and all they put into it, it's amazing that his paddle can be found for under $60! Runner Up - The Venom by Pickleball Inc. The Venom was featured in our other article The Best New Pickleball Paddles for 2017, and for good reason. Pickleball Inc has essentially been around as a proven pickleball paddle maker since the sport's inception. And they're not afraid to use their history and tradition and use it as inspiration for future paddles. The Venom uses its unique "tear drop" tapered shape to place more of its overall weight in the paddle's head; much like a tennis racket or traditional wooden pickleball paddle. This, along with it's innovative and proprietary nomex core Pickleball Inc calls their "PFG2 Core" give this paddle great balance, symmetry, control and exceptional power. As we've mentioned before, most nomex paddle cores tend to be the loudest (we love the trademark "pop") and create a defection response where the ball virtually leaps off of the paddle back at your opponent. However, Pickleball Inc's PFG2 nomex core is ahead of its time, allowing the paddle to remain remarkably quiet. The finishing touches are a composite paddle face for extra grab and spin and an elongated "tennis-like" handle for better control of the heavy paddle head. Pickleball Inc did it right and for a reasonable price, has made one of the best pickleball paddles for beginners. Paddle Dimensions: 15 3/4" x 8 1/8"
Pickleball players coming directly from a tennis background immediately love this paddle because of it's longer handle - perfect for overhead smashes at the kitchen line. Also, players adopt quickly to its unique weight distribution (specific to the paddle head being heavier) and find it easy to control it's power while still getting ample touch for dinks. New players rave about this paddle's control and specifically mentions how much grab the paddle has due to its textured composite surface. Beginners will immediately notice better pop and power from this paddle, especially if you're coming from other cheaper paddles from lesser known brands. Pickleball Inc has found a nice weight range for this paddle, making it easy to play with for extended periods of time for both novice and intermediate players...and as the video above showcases...you can win tournaments with this paddle as well! The Venom represents one of the better paddles from Pickleball Inc! Video Source: unplutocratical, video features the first generation Rally Graphite. The Rally Graphite has been around for years but recently got an upgrade with it's "2.0" version. We reviewed the original Rally Graphite, you can find that here. The 2.0 is on our list of best beginner paddles because it offers a good blend of power and control. The 2.0 is slightly heavier than the first installment, giving the paddle a little more punch with your follow through. It's a medium weight paddle, which we recommend for beginners because a heavy weight paddle takes time to reel in while a feather weight paddle takes practice to find the right amount of swing to generate power. At about 8 ounces even, the Rally 2.0 finds a happy medium, limiting break in time. This is ideal for new players perfecting their serve and placing the ball deep at their opponent's baseline. The 2.0 also gets a different paddle core. The original Rally Graphite, had a Nomex core to generate "pop" to help compensate for it's lighter weight. The Rally 2.0 Power however offers more control, touch and feel at the net with it's polymer core. In addition, it's features a thicker polymer core - offering players a larger overall sweet spot. For new players, the more forgiving the paddle, the better. ​Newcomers to pickleball like this paddle because despite it's slightly heavier weight (compared to the original) it has a very light weight feel, and is easy to swing. New players upgrading from wooden paddles will no longer feel as if their wielding a sledge hammer and will immediately notice an improvement in their dink game. The combination of an 8oz paddle with a thick polymer core gives newbies the perfect balance of power, touch and control; three things beginner level players wrestle with constantly. ​This paddle is durable both in it's construction and it's long term playability. Players moving up from 3.0 to 3.5 will not feel as if they need another new, more expensive paddle. This paddle will grow with your game and not need replacing 6 months in. The price can't be beat either. It's available everywhere but Amazon typically has the lowest price. It's even cheaper than the original Rally Graphite! So you're paying less, for the upgraded version! For those of you who might be coming from a tennis background, the name HEAD will sound familiar. HEAD’s expertise in the tennis game with supremely popular and successful tennis racquets make it an easy translation for them. In fact, HEAD’s Radical line of racquets finally makes it’s way from the tennis courts to the hard courts of pickleball! That’s right, if you’ve played with a HEAD Radical tennis racquet, then you know what you’ll be getting with it’s pickleball cousin. HEAD’s Radical line of pickleball paddles are the Tour, the Pro and the Elite. The Tour and Pro are more seasoned paddles for veterans while the Elite is HEAD’s powerful entry level option. It’s inexpensive, weighs in at a sturdy 8.1 ounces and is easy to pick up and get a feel for, thank to it's soft ergonomic grip. For newcomers looking for a great paddle from a reputable company that will grow with them as they gain skill, the Radical Elite is in our opinion, one you must look at. Paddle Dimensions: 16" x 7 7/8"
We feel beginners will immediately appreciate this paddle's large hitting surface. At 16 inches long and nearly 8 inches wide, the sweet spot on this paddle is fantastic, giving new players lots of forgiving real estate on the hitting surface. Lots of new players claim that this longer paddle face benefits them on their serves and we'd agree. Players of all skill levels appreciate HEAD's approach to this entry level model. They priced it perfectly and put in just enough paddle technology for the recreational fan looking to improve their game without needing fancy extras that can drive the price up. HEAD opted to exclude their "Extreme Spin" technology from this paddle for a reason, giving beginners a paddle that has everything they need and nothing they don't. It's a great realistic approach. Selkirk has been a respected brand in the world of pickleball for years, and the Neo Composite represents their best paddle for new players. The Neo comes in two simple yet flush color options; red or blue but Selkirk did not skimp out on the paddle tech they put into their entry level option. The composite paddle face allows this paddle to provide both spin and power while remaining exceptionally light on it's feet. Weighing in at 7.6-7.9 ounces, this is a well balanced, surprisingly light beginner paddle! Newer players will appreciate the Neo's light weight and fast response at the net, which isn't always felt with composite paddles, let alone budget ones. Beneath it's composite face is an advanced polymer core. Despite it being an entry level option, Selkirk has incorporated it's PowerCore polymer technology. As a new player, all you need to know is that this gives the paddle touch and feel beyond it's minimal price tag. The best pickleball paddle for beginners should combine great design and manufacturing while maintaining a low price point...the Neo Composite from Selkirk does just that! Paddle Dimensions: 15 1/2" x 7 5/8"
Beginner pickleball players, especially female players, will notice and love this paddle's small grip. In order to appeal to players with small hands, it's circumference is on the thin side. However, players with larger hands or players wanting a thicker, more durable grip can easily add grip tape to reach their desired fit. Selkirk did this to reach more new players and appeal to the masses. We appreciate this approach. Overall, new pickleball players like this paddle because it's light weight, agile at the net and is extremely easy to control because of it's small grip.​ This paddle excels at the net and provides novice to intermediate players loads of control and accuracy during dink play and rallies. In addition, newcomers to the game love the fact that you can usually by these paddles two at a time and get an even better deal! Click below for a package deal of two paddles and four balls! The Fusion 2.0 from Gamma Pickleball is a wide body paddle offering a large 8 inch wide paddle face giving new players more hitting surface. Inside the paddle, Gamma opted to go with an aluminum honeycomb core. This means it's harder than soft "polymer cores" found in many of today's paddles but softer than the extra rigid "nomex" cores found in power paddles. Essentially, with an aluminum core, the Fusion 2.0 offers a good balance power and touch. The paddle face is manufactured out of a fiber glass composite face giving you a playing surface designed to grab the ball and even slow it down. This effectively gives you the chance to dictate the pace of the match and control more points - perfect for a beginner player. This is why the Fusion 2.0 has made our list of the best pickleball paddles for beginners. Paddle Dimensions: 15 5/8" x 8 1/4"
Newbies looking for a good beginner paddle love the Fusion 2.0 because it's suitable for multiple skill levels, not solely a new recreational type of player. Novice to intermediate players will like this paddle because as they grow into a 3.0 or even 3.5 level player - this paddle can still offer what they need to take their game to new heights. In short, it's versatile beyond it's entry level price tag. Beginner players find that the paddle weight and composite face lends itself well for power and control - giving new players ample spin opportunities as they improve their game. It's got enough weight to not be a wimp at the baseline, especially when trying to serve deep or returning serves deep. It's also got enough composite texture to grip the ball - a great set of features for any new player! This graphite paddle from Upstreet represents our budget pick. For those looking for a quality paddle for under $50, this could be your best bet. Upstreet is a new name in the paddle business and is clearly targeting a younger more recreational type of player with their products. Their signature paddle is this inexpensive graphite option boasting many colorful, youth inspired color options and graphic designs. It's a heavy paddle at 8.6 ounces but that's because Upstreet uses a unique cell structure for it's polypropylene honeycomb core. This gives the paddle a more uniform mechanical structure for optimal performance. It should be noted that this paddle is the only paddle on our list not approved for tournament play by the USAPA. Our take: if you're looking for a basic recreational paddle, ideal for outdoor use, this could be a great budget friendly pick. Beginner players who tend to be more recreational and play outside like this paddle because it's durable, stylish, and comes with a paddle cover! It doesn't hurt that the price tag won't break the bank either and can easily be purchased in larger quantities for group or family play. Despite having a graphite face (which tend to be lighter), it's 8.6 is beefy. But, a lot of that weight can be felt in the shaft or handle. This can make it feel more like a tennis racket than a pickleball paddle - which for some new players, will be ideal. Many players coming from cheapo wooden paddles gravitate towards the Upstreet Graphite and love it's durability and brag about how well it's made. Upstreet also has a stellar reputation for customer service should you have questions or comments. The Paddletek Ranger is truly one of a kind. It's the first and only pickleball paddle designed for kids! If you're looking for a paddle that is perfect for a grandchild or little one in grade school, then this is the paddle for you! Paddletek stepped up and became the first major paddle manufacturer to target a younger audience - kids 12 and under! Every aspect of this paddle's design was done with the younger generation in mind. From the grip, to the paddle's overall smaller profile, this paddle is perfect for the child in your life who wants to join you at the local pickleball courts! As you'd expect, this paddle's weight is extremely light - 6.5 to 6.9 ounces to be exact, making it very easy to pick up and play with. To go along with the light weight, Paddletek has incorporated an extra long handle (to allow for two handed grip) and an extra large 8 inch wide paddle face. This is an ideal combination for a pickleball paddle designed for kids. Paddle Dimensions: 15 1/2" x 8"
1. It's 8" wide paddle face giving younger players a large hitting surface and extended sweet spot. 2. It's extra long 5 inch grip! Paddletek made the handle longer so kids can grip the paddle with two hands - giving them an added level of comfort and control. The long handle designed for two hands along with the paddle's light weight make it the ideal pickleball paddle for kids 12 and under. We hope you enjoyed our run down of the Best Pickleball Paddles for Beginners! Is it extensive? Yes, but we feel these eight paddles represent the very best in paddles designed with a beginner in mind. If you're looking to upgrade beyond a beginner paddle, check out our post on the Best Pickleball Paddles for 2018! Leave a comment below, we'd love to hear from you! What paddle do you use? Why do you like it? Pickleball Gifts – Your 2018 Holiday Gift Guide!